Strange things happen on islands. I should know, I live in the U.K., an island currently searching its bottom drawer for a backup drawbridge, in fitful attempts to become even more island-y, if you know what I mean (#ongoingtopicalgag). About a year ago, I vaguely recalled reading about the Barclay brothers who own the Daily Telegraph (among a hundred other businesses). The trivial fact that caught my attention wasn’t their steely-eyed commitment to small state economics, but that they both lived ina castle on Sark. 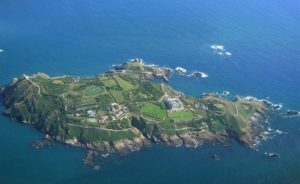 For the uninitiated, Sark is a tiny island in the Channel where cars haven’t yet happened, a place ruled more along the lines of a Game of Thrones sub-region (House Barclay? ), and yet still hold an outsize influence over the minds of Great Britain’s leaders. It’s a tax dodge one presumes. Sark, though. In common with the Isle of Wight, the Isle of Man and the others, there’s something inherently Tintin-esque about little kingdoms and overlooked empires, unfamiliar liveries and strange customs. Islands dramatise the distance between ambition and achievement – the smaller they are, the more the effort to organise seems sweetly (or darkly) bizarre. You get the same feeling in Port Meirion, the world suddenly seems over determined, like someone has invented a place based not on experience but a borrowed recollection. The scale is all wrong. But always strangely intriguing. Anyway, here’s a little extract from the ‘Not from above’ book, read by me in a voice-over style we’re calling ‘Jackanory-noir’… Enjoy, and don’t forget to pledge/pre-order the book and album from Unbound.com. Thanks!